In 2016, smugglers, migrants, and asylum seekers responded to policies and measures aimed at managing spontaneous migration flows, including the building of walls and closure of borders, by shifting routes and getting more creative in their attempts to reach their destinations. Migrant and smuggler perceptions of looming policy changes also played an important role in influencing flows and routes. Many migrants continue to rely on smugglers, who have become increasingly organized and sophisticated, to facilitate their journey. Together, these shifting flows and the government responses to them comprise an ever-evolving cycle of adaptation. Beginning in 2015, migrants heading to the United States shifted routes, increasingly opting to travel through South and Central America to circumvent U.S. maritime enforcement in the Caribbean. A growing number of Cubans chose to make this journey in 2015 and 2016, motivated by the perception that U.S. “wet foot, dry foot” policies, which grant Cubans who reach U.S. soil asylum and a fast track to permanent residency, might end due to a thaw in diplomatic relations between the two countries. Traveling by land initially afforded Cubans increased access to the United States, as many transit countries either did not require them to get an entry visa or lacked consistent return policies. Grappling with overwhelming flows, some transit countries in Central and South America began to introduce enforcement measures by early 2016 to deter Cuban migrants, leaving thousands stranded and opening new markets for smugglers. Ecuador—the entry point to the region due to its relatively lax visa policies—instituted visa restrictions for Cuban migrants, Costa Rica escalated enforcement along its southern border, and Nicaragua closed its border with Costa Rica. In a short-lived regional response, Mexico and Central America suspended returns to Cuba and instead coordinated charter flights and ground transportation to send stranded Cuban migrants to the U.S.-Mexico border. By August 2016, however, transit countries had introduced or reinstated returns to Cuba, and nine Latin American countries had formally requested that the United States terminate its preferential immigration policy for Cubans, blaming it for the “disorderly, irregular, and unsafe” passage of Cubans through the region. Following the route forged by Cuban migrants, an unprecedented number of Haitian and African migrants also made their way to the United States through South and Central America. This included many Haitians coming from Brazil, where they had resided since 2010. Haitian and African migrants traveling by land are less likely to be returned while en route than those traveling by sea, who are more likely to face U.S. maritime enforcement. Transit countries are often unable to establish contact with Haitian or African consulates, and/or lack return agreements with these countries. Additionally, Haitian migrants often identify themselves as Congolese to avoid being returned, owing to a perception that transit countries are less likely to prioritize the more-expensive return of African migrants, according to government reports. An estimated 4,000 Haitian migrants and 11,000 African migrants reached the U.S.-Mexico border between January and October 2016, overwhelming the capacity of U.S. authorities to process their asylum cases and Mexican authorities and civil society to provide them with shelter and basic services. Citing intelligence reports and apprehension data from transit countries, U.S. officials have suggested that tens of thousands of Haitians could be en route to the United States. At the same time, Haitians also migrated to Chile in large numbers in 2016, signaling the potential rise of the country as a migrant destination in Latin America. According to government reports, an estimated 34,000 Haitians migrated to Chile using tourist visas between January and September 2016, compared to 21,000 arrivals between 2013 and 2015. After arriving in Chile, primarily by air, many Haitian migrants seek employment contracts that would allow them to stay in the country and apply for legal residence after their nine-month tourist visas expire. Some migrants who are unable to find work purchase fake employment contracts—a trend that has caused increasing concern among Chilean authorities and legislators. Ramped-up enforcement efforts in Europe have also led migrants, asylum seekers, and the smuggling networks on which many rely to change routes and tactics. Following an unprecedented number of arrivals in 2015, a series of coordinated restrictions on border crossings in the Western Balkans effectively closed the route by March 2016, dramatically reducing migration flows through that corridor. Whereas 128,000 illegal border crossings were detected along Western Balkan routes in January, fewer than 7,000 were detected in June. However, the drop in numbers has been accompanied by a splintering of migrant flows from one main corridor to a wider range of routes, as migrants seek new openings through the Western Balkans and into the European Union. The closure of the Croatian-Serbian border, for instance, made the route from Serbia to Hungary more popular. Others have attempted to cross fences and closed borders. Traffic along the sea route through Turkey and into Greece—the maritime corridor that saw a major spike in arrivals in 2015—has dropped drastically following a deal between the European Union and Turkey aimed at reducing flows from Turkey to the Greek islands. However, while traffic through the Eastern Mediterranean has decreased overall, flows along the sea route have picked up slightly since July 2016, and the numbers traveling via land from Turkey to Bulgaria have also risen. By contrast, migrants crossing the Central Mediterranean by sea from North Africa to Italy—the most dangerous route to Europe—increased both in number and as a share of overall flows to Europe in 2016. Nearly 171,000 migrants arrived in Italy via the Mediterranean between January 1 and November 26, surpassing 2014’s record number. Casualties along this route have also risen: Approximately 4,200 deaths were recorded in the Central Mediterranean as of the end of November 2016, compared to 2,900 in all of 2015. Due either to changes in business models or efforts to evade detection, smugglers have used flimsier vessels—often made of rubber and unable to complete the voyage to Italy—and transported larger numbers of migrants at a time, complicating search-and-rescue efforts. Most migrants headed for Italy continue to depart from Libya, facing substantial risks on land as well as at sea due to insecurity in the country. However, an increasing number of migrants, mainly from the Horn of Africa and Egypt, have opted to cross from Egypt in 2016. Importantly, increased flows here are not a result of stricter measures in the Eastern Mediterranean; the nationalities of migrants traveling along the two routes continue to be distinct. Some migrants have also attempted to reach Europe by circumventing the Mediterranean altogether. A spike in migrants traveling the so-called Arctic route through Russia into Norway or Finland surprised authorities. Though these flows were tiny compared to those traversing the Mediterranean, more than 5,000 migrants took advantage of border policy loopholes to cross into Norway on bicycles in 2015, before Russia reinstituted stricter controls and the flow shifted to Finland in early 2016. In the Atlantic, traffic along the Western African route to the Canary Islands also increased noticeably into 2016, albeit remaining at relatively low levels. Dynamic flows and large numbers of spontaneous arrivals have prompted destination countries as well as an increasing number of transit countries, including Turkey and Mexico, to step up their enforcement efforts in 2016. Mexico has resumed returns of Cuban migrants, and Turkey, in addition to its agreement with the European Union, plans to complete construction of a wall along its border with Syria early next year. Additionally, destination and transit countries are increasingly seeking the cooperation of origin countries to manage irregular migration flows. Mexican authorities are attempting to establish return agreements that would facilitate the return of Haitian and African migrants. Similarly, the European Union is working to facilitate returns and curb migrant flows to Europe through agreements with key origin countries in Africa, including Ethiopia, Mali, Niger, Nigeria, and Senegal. 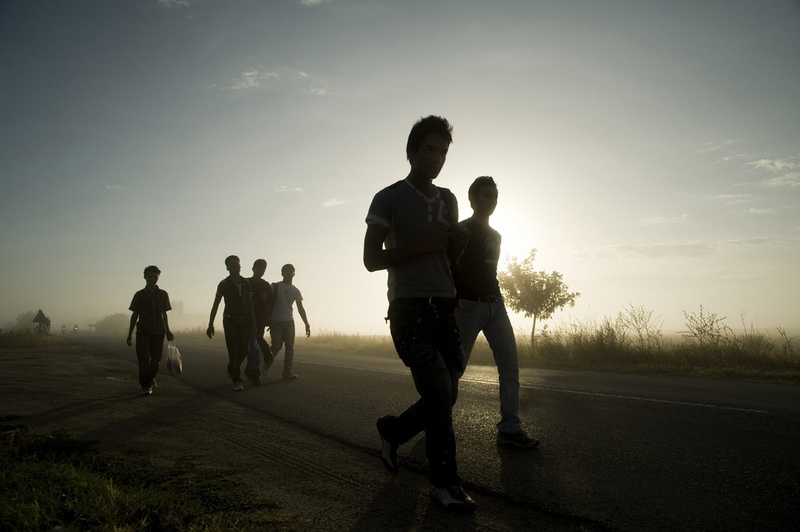 As shifts in migration flows in Latin America and Europe—as well as subsequent policy responses—suggest, international coordination will likely continue to gain in importance as a tool for countries seeking to manage migration. Adriasola, Lucía. 2016. En seis meses han llegado ocho veces más haitianos que todos los arribados durante 2013. El Mercurio, August 14, 2016. Available online. Althaus, Dudley. 2016. Cuban Migrants, Seeking Asylum in the U.S., Cross Into Southern Mexico. The Wall Street Journal, January 13, 2016. Available online. Associated Press. 2016. Ecuador Imposes Visa Requirements to Stem Cuban Migration. Associated Press, November 26, 2016. Available online. Birnbaum, Michael. 2016. Migrant boat traffic from Libya to Europe is surging — and turning deadlier. The Washington Post, November 30, 2016. Available online. Cambronero, Natasha. 2016. 95% de los migrantes irregulares son haitianos ‘disfrazados’ de Africanos. La Nación, August 9, 2016. Available online. Chishti, Muzaffar and Sarah Pierce. 2016. United State Abandons its Harder Line on Haitian Migrants in Face of Latest Natural Disaster. Migration Information Source, October 26, 2016. Available online. Coskun, Orhan and Daren Butler. 2016. Turkey to Complete Syria Border Wall Within 5 Months, Official Says. Reuters, September 28, 2016. Available online. Ecuador Foreign Ministry. 2016. Nine Latin American Countries Sign Letter Urging the United States to Review its Policy on Cuban Immigration. August 29, 2016, Available online. EFE. 2015. Latin American Nations Seek Solution for Cubans Stranded in Costa Rica. Agencia EFE, November 29, 2015. Available online. ---. 2016. Colombia to Deport Cubans Gathered Near Panama Border. Agencia EFE, August 1, 2016. Available online. ---. 2016. Cuba y Honduras dialogan para regular el flujo de Cubanos. Agencia EFE, November 22, 2016. Available online. El Heraldo. 2016. Honduras: Alarmante llegada de africanos en su paso a Estados Unidos. El Heraldo, November 20, 2016. Available online. Excelsior. 2016. Este es el protocolo que reciben migrantes Haitianos y Africanos en México. Excelsior, October 12, 2016. Available online. Frontex. 2016. FRAN Quarterly: Quarter 1 January-March 2016. Warsaw: Frontex. Available online. ---. 2016. FRAN Quarterly: Quarter 2 April-June 2016. Warsaw: Frontex. Available online. ---. 2016. Western Balkans Quarterly: Quarter 2 April-June 2016. Warsaw: Frontex. Available online. Gómez Quintero, Natalia. 2016. ‘México No Abrirá más Programas Para Trasladar Migrantes’: Flores Liera. El Universal, August 7, 2016. Available online. Guarascio, Francesco. 2016. EU Agrees to Boost Efforts to Tackle Illegal Migration from Africa. Reuters, October 20, 2016. Available online. Higgins, Andrew. 2016. E.U. Suspects Russian Agenda in Migrants’ Shifting Arctic Route. The New York Times, April 2, 2016. Available online. International Organization for Migration, Missing Migrants Project. 2016. Mediterranean Sea. Updated November 28, 2016. Available online. Kingsley, Patrick. 2016. Tens of Thousands Migrate Through Balkans Since Route Declared Shut. The Guardian, August 30, 2016. Available online. Labrín, Sebastián. 2016. Fiscalía indaga presunto tráfico de migrantes haitianos en aeropuerto. La Tercera, November 11, 2016. Available online. Marti Noticias. 2016. Desmantelan red de coyotes que movía a Cubanos desde Ecuador a Panamá. Marti Noticias, May 3, 2016. Available online. Migrant Offshore Aid Station Foundation. 2016. Search-and-Rescue in the Mediterranean More Dangerous Than Ever as 2016 Becomes Deadliest Year on Record. Press release, November 16, 2016. Available online. Millan Lombrana, Laura. 2016. America’s Poor Turn South as Trump Looks to Block the Road North. Bloomberg, November 21, 2016. Available online. Sánchez, Laura. 2016. Haitianos se hacen pasar por Africanos en Tijuana. El Universal, September 2, 2016. Available online. Spindler, William. 2016. Migrant and Refugee Boat Tragedy and Irregular Departures from Egypt. United Nations High Commissioner for Refugees, news release, September 23, 2016. Available online. United Nations High Commissioner for Refugees (UNHCR). 2016. Mediterranean Death Toll Soars, 2016 Is Deadliest Year Yet. News release, October 25, 2016. Available online. ---. N.d. Refugees/Migrants Emergency Response – Mediterranean. Accessed November 15, 2016. Available online. Finnish Broadcasting Company (YLE). 2016. Border Guard: Finland Could See 7,500 Asylum Seekers Enter from Russia. YLE, January 11, 2016. Available online. For more timely analysis on immigration issues around the world, delivered right to your inbox, sign up now for the Source bimonthly newsletter. Caitlin Katsiaficas is an Associate Policy Analyst with MPI's National Center on Immigrant Integration Policy. Ariel G. Ruiz Soto is an Associate Policy Analyst at MPI, where he provides quantitative research support across MPI programs.